I did a little more fluffing on the mantel this weekend. I like to add or tweak as the days go by and I have the time, come across an idea or stumble across a forgotten ornament or a sale in a chic little boutique (okay, in Harris Teeter, ornaments were 75% off!). If I can, I’ll post an udated picture this week. 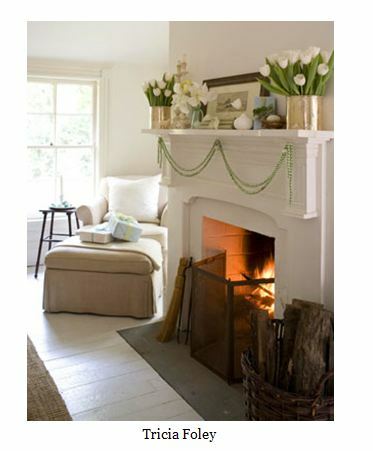 In the meantime, I wanted to show you some pictures I saw on another blog that I enjoy reading–Habitually Chic. 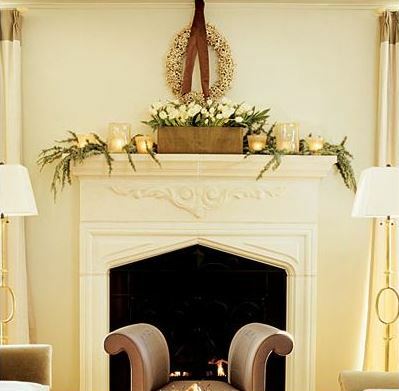 Here’s a mantel that is gorgeous, BUT it looks like a fire hazard for those of us who actually use our fireplaces. 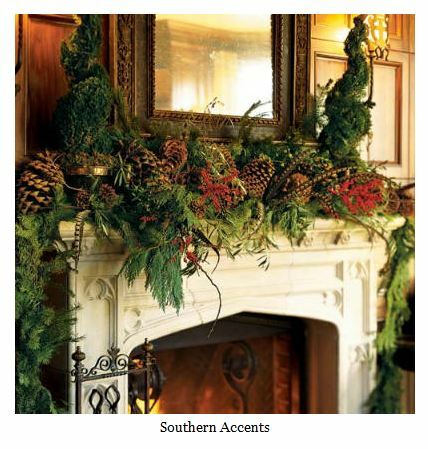 Yes, there’s a roaring fire in the photo, but I just can’t imagine… Anyway, pretty picture, great mantel. I’m a sucker for pine cones. I’m going to try to remember this one for next year. Not a big fan of that wreath hanging on the wall, but I like the clean, quiet vibe so much. Will keep my eyes peeled on my shopping adventures for a long, narrow container for the center, and maybe can put something taller in it. Then I wouldn’t need the wreath. Again, clean lines, simple. Looks kind of beachy to me. Here’s one more. 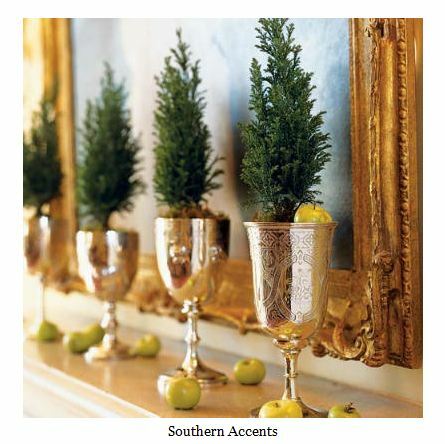 I’ve put candles in old champagne glasses many times, but this is a new twist for me–a little greenery in silver chalices. Just wanted to use the word “chalices,” thanks for letting me. Have a great week. Light candles, make cookies, play with a child (or a childish adult). Breathe.